The wine is the most consumed alcoholic beverage in the world. There are different winemaking methods, each one meeting the criteria desired by the producer and meeting consumer’s requirements and expectations. One of the main difficulties of this winemaking process is to control the gas exchange during all the process and especially before the bottling. There are different methods to dose, adjust the amount of gas in the wine, which are more or less expensive and efficient. Introduced for ten years, membrane becomes an important tool in the food industry, especially for beer, soft drinks and fruit juice. Today there was a new interest in using the membrane contactor (MC) to optimize the gas exchange in wine. 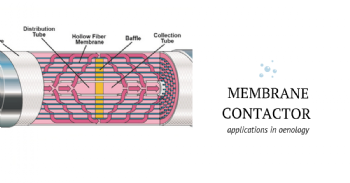 A MC is a module consisting of hydrophobic hollow fiber membranes. Usually, the gas circulates inside the fibers (lumenside) while the wine circulates outside the fibers (shellside) in the opposite direction. And it is by a difference in concentrations and partial pressures of the gases on either side of the membrane that the gas exchange is done. Firstly, it is important to measure the oxygen (O2) and carbon dioxide (CO2) content and to define the levels to be achieved before to adjust dissolved gases. In most cases, O2 must be removed to prevent wine oxidation. On the contrary, CO2 must be adjusted to a concentration appropriate to the desired wine style. In rosé and white wines, the CO2 concentration is raised, while for the reds the CO2 is removed (but not totally), which is often in excess. Also the interest of the use of MC in semi-sparkling and sparkling wines (not Champagne where the bubbling is caused by a second fermentation in bottle) is more and more important, because it allows to obtain a drink with very fine bubbles and significantly different from that which can be obtained by carbonizing a wine with a simple gas injector. So this bibliographic report aims to present MC technology allowing the control of dissolved gases in wine. It includes a whole theoretical part concerning the generalities on the gas exchanges, the flows of gas through the membrane, the resistance of the membrane, etc., then a more in-depth part on the MC and its use, on the various operating modes to follow depending on the desired objective. On the other hand, some generalities on the different applications and fields of action of MC will be mentioned, and finally a last part concerning the characteristics of the membrane.